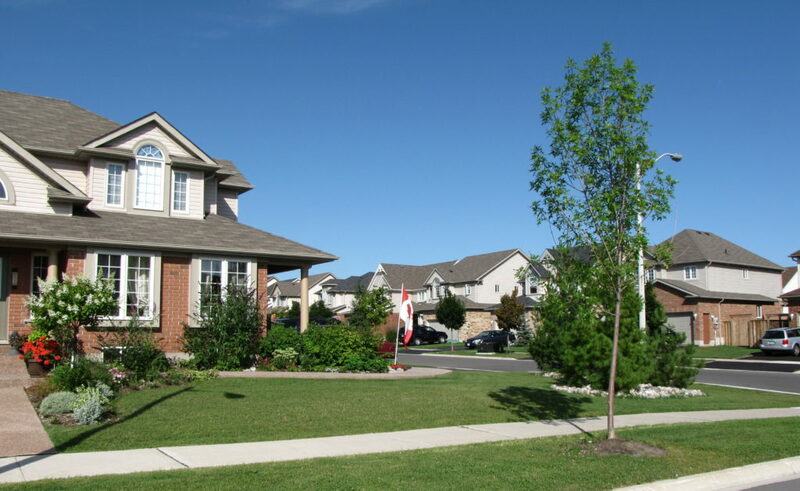 Georgian Meadows is a residential community of 430 single detached homes in the west end of Collingwood. With six phases, now fully built-out, the Plan of Subdivision for this ENERGY STAR® certified development was the largest and first of its kind in the Town when initiated in the early 2000s. Crozier & Associates was fully engaged in all aspects of the development process for this project, which was originally a greenfield site. As part of the original planning approvals for the subdivision, extensive servicing works were required by the municipality to support possible future development in the west end of Collingwood. These included the design and construction of a 750m extension to a 400mm diameter municipal trunk watermain and over 2500m of a 450mm diameter municipal sanitary trunk sewer. Engineering features of the master-planned community include a regional stormwater management system integrated within a natural wooded area; playground parks and extra wide family-friendly streets. Central to the design are multiple connections throughout the neighbourhood to a network of Town trails that provide residents with direct access to surrounding natural areas including Black Ash Creek at the east end of the community.